These pictures were taken two weeks ago, around the middle of March! Many people think we don’t have seasons in Santa Barbara; but I am going to show you that we do! You can see the wisteria; which not only looks beautiful, but smells sublime! It creeps across the front of the garage, and around the side through the “sweet olive”! This is pretty much its prime; no leaves yet! 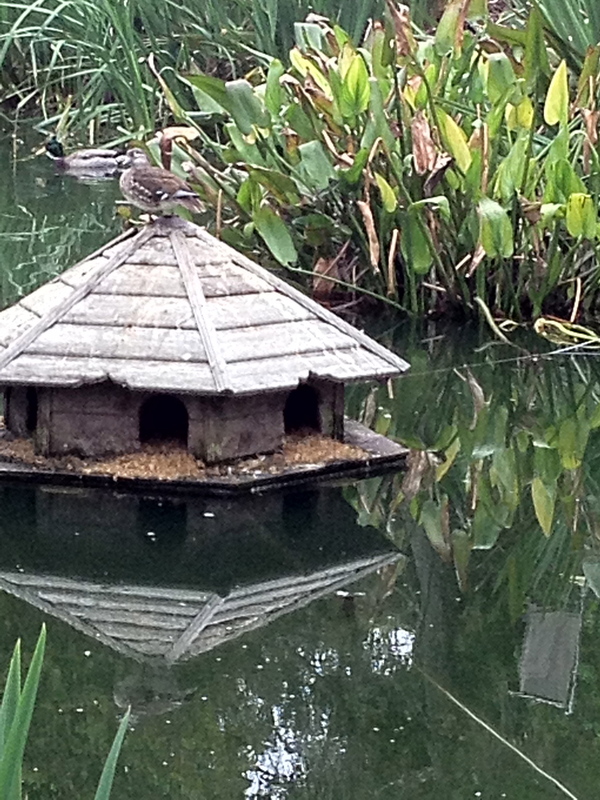 The finial fell off the duck house; I am not replacing it until the end of the summer! The wood duck loves posing as the finial! The juvenile black-crowned heron takes turns! And there is a mallard sitting on eggs in one of the nest boxes! This heron won’t hurt the baby ducklings; but we chase the Great Blue Heron out of here when there are baby ducklings! Our Boston ivy comes in red in the beginning; red leaves are not appealing to birds. The rooster is happy to have his tail feathers coming back!! The real roosters didn’t lose their tail feathers! This shows a glimpse of our mesquite front gate. This shows the mesquite railing that goes across a small stream from the pond ! It is interwoven with willow; so it is a living railing! The willow loses its leaves in the winter. Hardenbergia vine blooms in the winter (the purple one) and the white potato vine (a type of jasmine) blooms 12 months a year! Chickens busy at bug finding and eating! The crabapple fence just starting to leaf out in the herb garden! These steps are petrified wood! I love the rock edging on the herb garden; and the lavender planted in gravel. This is our “Certified Backyard Habitat ” sign! My granddaughter was in the first grade when we went online; filled out the application, and sent it in with photographs. It says “This property provides the four basic habitat elements needed for wildlife to thrive: food, water, cover, and places to raise young. We are very proud of that!! Our gardener planted these native iris two years ago as a surprise; he didn’t think they “took”; but look at them now!!!! When the gardeners on our lane “blow” (mercifully only once a week) , they leave the pile of oak leaves for us!! My favorite path material! More hardengerbia and potato vine and chickens! In a week or so; I will post what it looks like further along in Spring!